Paradise Bay is a Certified Dealer of Golden West Billiards and is an exclusive supplier in Calgary. Our showroom features the finest series of tables and accessories from Golden West Billiards. Golden West Billiards, MFG. is a family owned and operated company which started manufacturing in the late 1960’s. Their products are sold worldwide, and the main reason for their success is quality and control of their products. They are the only pool table manufacturer that does their own designing in-house and are a leader in product design, with many patents granted to them over the years. 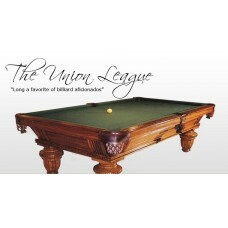 Have a look at our collection of Billiard and Gaming products online or come into our enormous showroom today. The Union League (shown in Oak with Mission Oak finish)The Golden West repu..